One of the things I really love about having a frugal living mentality is that when I get in the mood for something I don’t just run out and buy it, or even run to the store to buy the ingredients. I often try to create things that I really have no business creating based on what I have in the pantry. It’s such a challenge to satisfy a craving without spending a cent. Today was one of those days. I got home from an 11 mile trail run in the Santa Monica mountains and was HUNGRY! I don’t know why, but I was really craving pho. If you didn’t know, pho (actually phá»Ÿ) is a Vietnamese noodle soup. 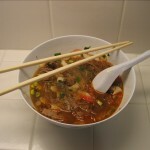 There are many variations but the most common varieties are made with a special beef broth, fresh herbs and rice noodles. Therein lies my first problem- I didn’t have any of the ingredients to make the broth (let alone 3 hours to simmer it) or any rice noodles. This is where some might have given up and just gone out. I, instead, took what I had and came up with something so close (at least in my opinion) that my craving was completely satisfied. The recipe that follows is really crazy. It’s really the anti-pho because it is so different from traditional pho but does keep some of the base flavors. I’m not sure I even want you to try to make it! I’m documenting this exactly as I made it partially so I can make it again. It is delicious but I wouldn’t want this to be your only pho experience since real pho is amazing. The following recipe made one big serving. Put the broth ingredients in a glass container and microwave until boiling. Layer ingredients in a big bowl in the order above. Microwave the broth again to bring to a boil. Pour broth into the bowl. Mix and eat. Remember that this is not real pho. 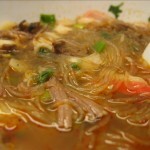 If you served this to someone from Vietnam they would probably not even recognize it as pho or even be able to eat it. If you’ve never had pho, go find a pho restaurant and get some because it’s usually really cheap and tasty. Then you can attempt to make your own once you know what it’s supposed to taste like.